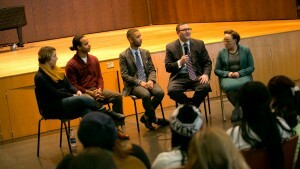 Lebanon Valley College values free speech, open dialogue, civility, and respect. 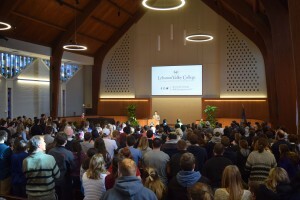 The Board of Trustees, administration, faculty, and staff are committed to ensuring that LVC is a welcoming and safe place for all and have made Inclusive Excellence a strategic priority. Our community members stand in unquestioned support of one another, value inclusion and diversity, and reject hate, bigotry, and discrimination. Here are some steps we have taken to strengthen LVC. Diversity: Individual differences (e.g., personality, learning styles, and life experiences) and group/social differences (e.g., race/ethnicity, class, gender, sexual orientation, country of origin, and ability as well as cultural, political, religious, or other affiliations). Equity-mindedness: A demonstrated awareness of and willingness to address equity issues among institutional leaders and staff (Center for Urban Education, University of Southern California). The following are outcomes outlined by AAC&U to inform climate and culture change within an institution, division and/or department. Create a climate that is supportive, respectful, and values differing perspectives and experiences. Demonstrate knowledge of contributions made by individuals from diverse and underrepresented groups to local, national, and global communities. Consider perspectives of diverse groups when making decisions. Function as members of society and as professionals with people who have ideas, beliefs, attitudes, and behaviors that are different from your own. We are a college because of the social and educational impact we can have on society, especially through our graduates. We are dedicated to learning from one another, to supporting the work and talent of each other, and to respecting the dignity and contributions of one another - this is a model our society needs as a foundation for democracy itself.